Cleptoparasite bees lay their eggs inside nests constructed by other bee species and the larvae feed on pollen provided by the host, in this case, solitary bees. The cleptoparasite (adult and larvae) show many morphological and behavior adaptations to this life style. In this paper I present some data on the cleptoparasite bees whose hosts are bees specialized to collect floral oil. Key words: solitary bee, interspecific interaction, parasitic strategies, hospicidal larvae. Palabras clave: abejas solitarias, interacción interespecífica, estrategias parasíticas, larva assassina. Usually the image of bees is associated to an insect visiting flowers to collect pollen. The sampled pollen will be deposited into a cell within the nest constructed by the bee to their offspring. Then, the young will feed on this provision and develop inside the nest, protected from the external world. This scenario is true for most bee species. But in nature, bees that have nests and keep resources (food) inside, always are at risk to be usurped (Michener, 2007). In the bee world this happens with certain frequency. There are many species that are specialized to make use of resources or nests prepared by other species. They are parasite bees. Some species, called social parasites (ex. Psithyrus) live inside the host colonies and the workers take care of their immature, like the offspring from the queen. There are also some species called robber bees (ex. Lestrimelitta) which invade sporadically stingless colonies and assault their resources storage. Finally, there are many species that deposit their eggs into host cells, where their offspring develop. In this case, these bees are named cleptoparasites and they are always associated with solitary bees1. Cleptoparasitism is defined as an ecological interaction in which the young of one species feed and develop with the food provided for the young of another species (Rozen, 2000). Therefore, common features to the cleptoparasite bees are: they do not construct nests, they lay their eggs inside nests built by other bee species and the larvae feed on pollen provided by the host (Wcislo, 1987; Rozen, 2000). It is an obligatory parasitism. The cleptoparasite bees are also know as “cuckoo bees” in relation to the cuckoo birds that hold a similar strategy. This paper deals with the life style of the cleptoparasite bees whose hosts are bees specialized to collect floral oil. The oilbees account for more than 400 species in the world (Alves dos Santos et al., 2007). They use floral oil to surface their nest and feed the larvae (Vogel, 1974; Buchmann, 1987). Probably the volatile compounds of the oil have an “attractive” effect and help the parasites to localize the nest in the field. Of the 16.000 described bees in the world, it is estimated that about 2.500 are cleptoparasites. Some groups are very diverse, like the subfamily Nomadinae (Apidae) where all the members are cleptoparasites, and summed ca. 1.300 species (about 800 only in the genus Nomada; Rozen, 1996; Michener, 2007). In the family Halictidae the genus Sphecodes is represented by about 300 cleptoparasite species, as well as Coelioxys in the Megachilidae, both worldwide distributed (Rozen, 2001; Michener, 2007). According to Rozen, 2000, there are 27 cleptoparasite bee lineages that evolved independently, and 15 occur in the Neotropical region. This richness probably is due to the high level of endemism in the region. The endemic Neotropic groups are: Megalopta, Megommation, Hoplostelis, Rhathymini, Isepeolini, Exaerete, Aglae, Coelioxoides (Rozen, 2000). Straka and Bogusch, 2007, analyzing characters of the adult and larvae in the family Apidae concluded that cleptoparasitism evolved independently only six times within the family against 11 times suggested by Rozen, 2000. Since they do not collect pollen, females of the cleptoparasite bees lack scopa, the structure in the body used to transport pollen to the nest. Usually this structure is a dense pilose area on legs or abdomen (Megachile) where the females insert the pollen grains between the hairs. There are also scopa modified in corbicula (or pollen basket), an smooth concavity on the hindtibia surrounded by a fringe of hairs, where females glue the moist compacted pollen mass. The cleptoparasite hold no kind of scopa. 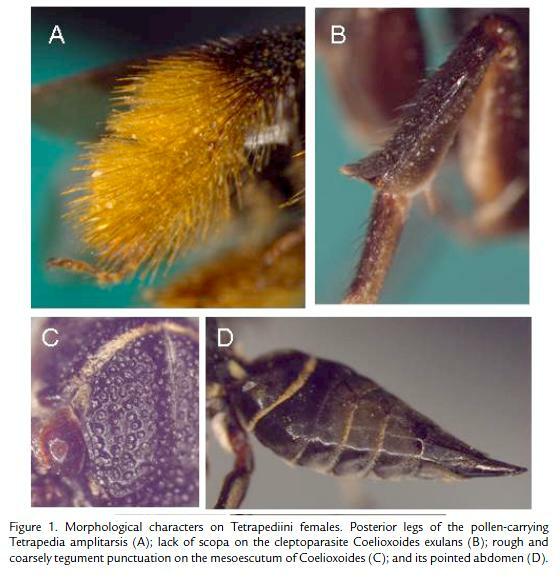 Figure 1 shows the differences on the hind leg between a pollen-carrying and cleptoparasite females, both of the tribe Tetrapediini. The tegument on the cleptoparasite usually is rough and coarsely punctuate (Fig. 1C), one adaptation to scape from host attacks. They also hold pointed axillae and metasoma apex (Fig. 1D), as well as reduced or not well defined basitibial and pygidial plate, as we find in most nest-constructing females (Michener, 2007). The goal of a cleptoparasite female is to lay the egg in a provisioned cell. To reach this objective, the adult has some strategies, which start with nest locating. The right host nest should be detected. In this case, distinctive odors are important signals, as is the case of the floral oil spread on the nest walls by the oilbees host, which smell strong. After locate the nest the cleptoparasite female will invade it. But before that, it lookout for and rest outside (sometimes a long period) to be sure that host female gets out, and avoid meeting its. Then the female enters the nest to inspect, this means to check in which phase is the brood cell. Cells that are already provisioned (partially or completely) and sometimes fresh closed are ideal to the parasites. The female turns back and oviposite, spending few seconds inside. If the cell was already closed, then it spends few minutes longer to reconstruct the operculum. Assuming this opportunistic way of life, it is easy to understand why the parasite females usually have a larger number of mature oocytes (eggs ready to be laid) in their ovaries (Rozen, 2003). Furthermore, their eggs show thick chorion and are relative smaller than those of related nonparasitic solitary bees, a character that helps the female to hide the eggs in the host brood cell. After this adult activity, now the survival depends on the immature. Parasite eggs hatch earlier. For example in Coelixoides waltheriae the egg last between 12-28 hours while by its host (Tetrapedia diversipes) ca. 4 days (Alves dos Santos et al., 2002). Then the parasite first instar crawls inside the cell and with its sharp mandibles kills the host egg. Rozen, 1991 and Rozen, 2001 described larvae (first-stage to mature larva) of many cleptoparasite species and associated the characters to their behavior relating to the host kill. Rozen et al., 2006, presented a comparison of the modes of parasitism and anatomical features of the first instars of the cleptoparasite groups in the family Apidae, to which most of the cleptoparasite of oilbees belong. The development of the parasite larvae then continues in the same way as a host larva. It feeds on the provision all the time, suffer 4-5 moults, pupated and at the right moment emerge as adult, starting the cycle again. Following the Emery’s rule the cleptoparasites tend to be associated to species or genera to which they are closely related. Among the oilbees this seems to be also true and was confirmed in some groups. For example, the Paleotropical tribe Ctenoplectrini is composed by only two genera: Ctenoplectra and Ctenoplectrina, been the first composed by nest-making and oil-collecting bees and the second cleptoparasite of the first (Michener and Greenberg, 1980, Michener, 2007). The same happens to Coelioxoides species that are associated to Tetrapedia nest, both belong to the tribe Tetrapediini (Alves dos Santos et al., 2002; Camillo, 2005). The possible phylogenetic relationship of the Osirini with the Tapinotaspidini was explored in a study on the genera Monoeca and Lanthanomelissa (hosts) and their cleptoparasites Protosiris and Parepeolus respectively (Rozen et al., 2006). Even before the phylogeny analyses are not yet established for all the oilbees and their parasites, there are many host-parasite specific associations. For example, Rhathymus (Rhathymini) so far is closely associated to Epicharis (Centridini). Studies on different species of Epicharis have recorded 1-2 Rhathymus species as cleptoparasites each (Gaglianone, 2005). Still in Epicharis there are additional cleptoparasites like Mesoplia and Mesonychium (Ericrocidini), usually associated to Centris nest (Hiller and Wittmann, 1994; Gaglianone, 2005). Centris’s cleptoparasites are most in the tribe Ericrocidini (Snelling and Brooks, 1985; Rozen and Buchmann, 1990). Genera like Mesocheira, Mesoplia and Mesonychium are common found in nests of Centris (Centris), C. (Hemisiella) and C. Heterocentris. Acanthopus (Ericrocidini) was recorded in the nest of Centris (Ptilotopus) (Rozen, 1969; Gaglianone, 2001). But besides the ericrocidines nests of Centris are also common attacked by Coelioxys (Megachilidae) species, which usually are cleptoparasites associated to Megachile. Coelioxys spp. emerged from nests of Centris tarsata, C. analis and C. trigonoides (Morato et al., 1999; Jesus and Garófalo, 2000; Aguiar and Garófalo, 2004; Aguiar and Gaglianone, 2005). According to Vinson and Frankie, 1988, Centris flavifrons construct false branches on the nest to avoid the parasites in Costa Rica; similar lateral tunnels were found by Chiappa and Toro, 1994, in the nest of Centris mixta in Chile. The genus Epeoloides (Osirini) is associated to the genus Macropis (Macropidini, Melittidae) an Holartic oil-collecting bee. Epeoloides pilosula can be inferred to parasitize multiple Macropis species and its host range quite possibly includes all four North American species (Ascher, 2005). The same is true to E. coecutiens in Europe which presumably parasite nests of Macropis fulvipes and M. europaea (Pekkarinen et al., 2003; Celary, 2004; Bogusch, 2005). So far, the nesting biology studies are showing that all the oilbee groups have their cleptoparasite association. Jesus and Garófalo, 2000, found also intra-specific parasitism in Centris analis, where a female invade and open a co-specific cell, feed on the host egg, oviposite and close the cell again. But this seems to be rare. The cleptoparasitism rate can be high, especially when the hosts are nesting in aggregation. For example high density of nests of species that are raised in trap-nest may facilitate attacks by natural enemies, including the cleptoparasites (Frankie et al., 1988). In Centris analis 10-30% of the brood cells were occupied by Mesocheira bicolor and Coelioxys sp. (Jesus and Garófalo, 2000). This ratio could be especially to concern if some of the oilbee species would be rear commercially to pollinate cultures like the wild cherry (Malpighia emarginata) which is pollinated by many Centridini species (Vilhena and Augusto, 2007). Besides the economical importance, the parasites play an important ecological role as population control in nature. Usually they appear and enlarge activity by the increase of the number of nest in a new nesting area, acting as a brake to the exponential tendency of population grows. We still missing many data about the cleptoparasite of the oilbees, especially of the tribes Ericrocidini and Osirini. It is not easy to find natural nests of solitary bees, but this is the first step to find and ensure their associates. 1 In the solitary bees just one female takes care of all the tasks like: building, provision, defending the nest and oviposition (Batra, 1984; Alves dos Santos, 2002). I would like to dedicate this note to Dr. Jerome G. Rozen Jr., the world authority on cleptoparasite bees and who taught me all I know about this fascinating interaction. I would like to thank the organization of the IV Encuentro Colombiano Sobre Abejas Silvestres, especially Dra. Guiomar Nates Parra for the invitation to participate in the meeting. I am grateful to FAPESP (Processo 04/00274-4) for the financial support. BOGUSCH P. Biology of the cleptoparasitic bee Epeoloides coecutiens (Hymenoptera: Apidae: Osirini). J Kans Entomol Soc. 2005;78:1-12. BUCHMANN SL. The ecology of oil flowers and their bees. Annu Rev Ecol Syst. 1987;18:343-369. CAMILLO E. Nesting biology of four Tetrapedia species in trap-nests (Hymenoptera, Apidae, Tetrapedini). Rev Biol Trop. 2005;53:175-186. CELARY W. A comparative study on the biology of Macropis fulvipes (Fabricius, 1804) and Macropis europaea Warncke, 1973 (Hymenoptera: Apoidea: Melittidae). Folia Biologica (Cracow). 2004;52:81-85. CHIAPPA E, TORO H. Comportamiento reproductivo de Centris mixta tamarugalis (Hymenoptera: Anthophoridae). II Parte: Nidificacion y estados inmaduros. Rev Chilena Entomol. 1994;21:99-115. FRANKIE GW, VINSON SB, NEWSTROM LE, BARTHELL JF. Nest site and habitat preferences of Centris bees in Costa Rican dry forest. Biotropica. 1988;20:301-310. GAGLIANONE MC. Nidificação e forrageamento de Centris (Ptilotopus) scopipes Friese (Hymenoptera, Apidae). Rev Bras Zool. 2001;18(1):107-117. GAGLIANONE MC. Nesting biology, seasonality, and flower hosts of Epicharis nigrita (Friese, 1900) (Hymenoptera: Apidae: Centridini), with a comparative analysis for the genus. Stud Neotrop Fauna Environ. 2005;40(3):191-200.